Group Therapy has a wide offwidth crack pitch and a fearsome looking roof up high as it ascends a crack system out on a wide face. 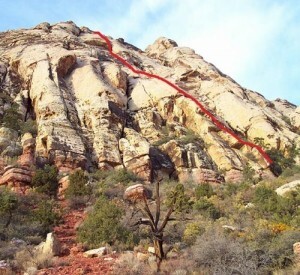 Group Therapy is the only climb in the area which gets much sun on the actual route. The roof is even more intimidating once you get to it, but is wild, fun climbing on good holds. Still, retreat from right before the roof is common as leaders face the frighteningly exposed climbing. Which SuperTopo guidebooks include a topo for Group Therapy? FA: Joe Herbst, Betsy Herbst, Randal Grandstaff, Matt McMackin, 1974. The first ascent of Tunnel Vision went so well that Joe and Randy returned the following weekend. This time the team was expanded to include Joe’s wife, Betsy, and Randy’s high school buddy, Matt McMackin. The route turned out to be a pleasure. The weather was perfect. The companionship was first-rate. Those wide cracks were mild enough to be fun. There were comfortable ledges to accommodate their large first ascent party. All in all, the quality of the day rose above pleasant, the entire Group agreed, and achieved the level of Therapeutic.